I don’t know how many of you know, but prior to giving birth to my twins, I had a podcast. Matter of fact, I launched that podcast while I was pregnant. Some of the positive and uplifting messages I heard when I interviewed guests, at times, reminded me to just keep putting one foot in front of the other and to keep going because God was watching over me. Those messages were so inspiring. That is why it hurt so much when I stopped the podcast. I had so many episodes recorded with amazing content, but as a new mom of twins, I didn’t have the time (and I didn’t have a team) to continue to edit them and post them. I tried to outsource the editing, but after the VA took my money she informed me that her staff member who was in charge of audio editing was on paternity leave and wouldn’t be able to start the project for at least a month. I had just paid her. She made big promises and in the end, couldn’t deliver. You’re probably wondering if I got the money back. The answer is “yes” after a month or two of back and forth about her deceitful business practices. After that defeat, I thought that podcasting wasn’t for me. I thought I was a failure. I pushed it into the corner of, “I tried that, but it wasn’t for me. It takes too much time.” However, something changed. I kept getting asked to release a new podcast, but I kept saying, “No. I tried it before and I didn’t have the time so why try again?” However, then I decided to not let the past defeat keep me down. I decided to start recording again. I decided to start interviewing again. I decided to get back up and try again. The funny thing is, when I looked back at the stats, even though I hadn’t released an episode in nearly 3 years, it turned out people were still listening. Over 3,500 people listened to the podcast and they were still listening! I couldn’t believe it! 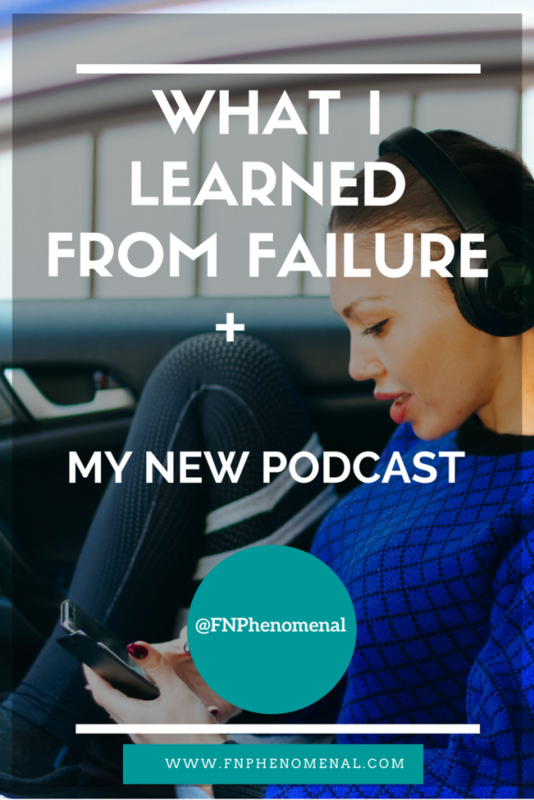 I wasn’t a failure and that podcast venture wasn’t a waste of time, because the people who needed to hear it heard the message. I decided to start podcasting again (the stats from the old podcast must have been a sign from God, right? ), but I didn’t want to jump without God blessing what I had already decided to do (backwards…I know). However, as I prayed for direction, God told me “no”, but too many people were asking for the podcast. It turns out that the person who said they would help made big promises, but in the end deceived me and even kept one of my podcast episodes and never gave it to me. I was crushed. Fortunately, we had only recorded 2 episodes. I thought this meant that God was telling me that podcasting wasn’t for me. However, it wasn’t that podcasting wasn’t for me. I was trying to do things out of alignment with what God wanted for me. A delay doesn’t mean a denial. I put the podcasting project down and waited a full year and then I started going again. This time I waited until I heard “yes” from God. I knew I needed someone to help with editing, but this time I chose someone with integrity and who truly was a follower of Christ and who believed in the mission of FNPhenomenal. I’m going to break down what I learned into 4 key lessons. Lesson 1: Operate in God’s timing. One of the hardest things for me is to be patient and wait for that “due time”. Sometimes I want to rush the process and fail to see the lessons and blessings along the journey. I recently had a conversation with some friends about the delay of my upcoming book. I knew my timing and everything that needed to be done to make that happen was carefully plotted on a project plan. When I realized there was going to be a delay, I got frustrated and sad. I started to focus on my plans for the book instead of focusing on what God told me to do which was to keep going and keep working. I looked at my timeline and not God’s “due time.” Although, God told me to write it, with each passing delay the book started to become more about my timeline than God’s will. What I failed to realize is that I began to elevate my needs over God’s kingdom needs and that is out of alignment. I spoke to one friend and she said maybe God wants you to learn something that you haven’t learned yet prior to the book being released. I quickly clapped back that I didn’t think so. Then, the next day I went to Bible study and was talking to some friends and in love, they repeated back to me what they heard me say. At that moment I thought…wow…. I can’t believe I sound like that. I took my eye off of the true purpose to the book, which is to help the single moms who read it realize that there is hope and that they don’t have to live a life of lack. Instead of the moms, in a subtle manner, I started to focus on my marketing plans and checking a box on releasing a project so I could move onto the next project that God told me to work on. I grew impatient and I started to miss the true goal of the book and the passion that fueled me through the nearly 2 years that I had been working on it which was to bring about change in the single moms’ lives who would read it. If I’m honest, the same thing happened when I was going to restart the podcast a year ago. It was about marketing, exposure, the potential to open additional doors for me, and someone else’s vision for my brand. It was about business growth and less about the moms who would listen which was why I initially pushed back (between that and not having the time). One of the loudest voices in my ear kept trying to get me to focus on the shiny object of a podcast – increased brand awareness – instead of what God was telling me to do in that moment. This is why it is so important to remove temptation and things that are not aligned with the Word of God, because if you don’t, then you can start to believe the hype. Think about it this way. When I read the story of Adam and Eve in the Garden of Eden, I couldn’t believe that they actually fell for the trick to eat the fruit. Come on…they were in paradise so why risk it? That’s the thing with temptation. It sounds good. It looks good, and sometimes if we aren’t careful we can convince ourselves that it is truly God’s will for our lives. That’s what happened to me when I was going to start to podcast a year ago and it didn’t work. I was deceived and I lost focus. When I realized it. I put the project on hold again, until it was truly God’s timing. I share this to say that a delay or difficulty may not mean denial. God can use delays for many reasons. You may need to put it on pause and pick it up again like I did with the podcast. There may be some things that you need to learn at that point in time, which is where I’m at now with the book delay. I know from personal experience and from hearing the testimonies of others, you don’t want to get elevated before you are ready. Think back to your past, and ask yourself if you ever got an opportunity before you were ready. You may have thought you were ready, but you weren’t and most likely it wasn’t a good or fun outcome. This is why you must humble yourself under God’s mighty hand and be patient and wait for Him to lift you up when He is ready because God’s timing is ALWAYS the best timing. Lesson 2: Listen to God when He tells you to walk away from certain people, projects, or situations. Have you ever heard the saying, “Trust your gut”? Your gut is that still small voice of God telling you what to do. It is your discernment. What generally happens when you don’t trust your guy? Disappointment. As I was debating starting the podcast a year ago, I knew the answer was “no.” Plus, something about the situation didn’t feel right. I was always unsettled, but I couldn’t explain why. The person who offered to help said the right things. They talked about their love of Jesus. I convinced myself that they were sincere, so despite the “no” I got from God, I said “yes.” I thought that I misread the “no” that God told me even though something felt off. However, when things started to deteriorate – promises not kept, files not returned on time (if at all), excuses, and poor communication – that’s when I realized that God was telling me not only not now, but also that the particular individual wasn’t the right person for my team. Therefore, when God tells you “no” or to “walk,” do it. Usually, you have a feeling that something isn’t right but also go to God in prayer, fasting, and reading of the Word to also make sure you are hearing Him. If He tells you to move, then move because it is for your good. You never know what He may be protecting you from. Lesson 3: Don’t be afraid to get back up again. Just because something didn’t work in the past, doesn’t mean it won’t work now. Have you ever worked at a job and every idea you had they said, “We tried it before and it didn’t work”? Even if they tried it 20 years ago they still shut it down! It was probably frustrating and demoralizing to hear your ideas get shut down. That used to happen to me and eventually, I stopped providing ideas because no one wanted to hear them. The thing is that this sense of giving up doesn’t just happen at work it can happen in our lives as well. When something doesn’t work we can get afraid or jaded. Being cautious is a natural response because it is our body’s way of avoiding pain. That is a good idea when you are trying to protect yourself from injury, but running away from taking chances might stifle your growth, opportunities, or even your ability to live a full life and it can also impact your finances. For example, if you have invested in the stock market before and it didn’t work because you lost money, that doesn’t mean you should give up investing. Instead, it means that you may need to research the investments a bit more, adjust your risk levels, or maybe even reduce the amount of money you invest if the potential loss is too great. Refusing to invest means that you give up your opportunity for the exponential financial growth that allows you to see a bigger return (increase on your money) that the stock market can bring over the long-term (P.S. Check out Ellevest for a free investment plan to assist you with your goals-based investing.). This is just one example of many, but I picked this one because it can be easier to think of other examples and miss the ones that directly impact our finances. If I’m honest with myself there have been plenty of times when I gave up rather than keep going. However, although giving up the sins that are removing you from God’s will is a good thing, quitting when you are on the path that God has you on is not. Giving up and refusing to take chances removes the opportunities to learn from your mistakes, make you a better person, and make better decisions. It also will turn you into a quitter. That’s what I almost did when I looked at my past podcast failures and almost gave up on podcasting. No doubt those past failures were disappointing but had I quit, I would have lost the ability to do some introspection to see what worked and what didn’t and how I could grow and make the next attempt better. Having the right team in place makes the difference. When I tried to do everything in the past with the podcast: recording, booking interviewees, editing, creating the blog pages with the show notes, uploading the podcast into the system, and marketing, it was too much. It took too much time and I couldn’t keep up with everything. Plus, I was operating outside of the gifts that God blessed me with. I was missing the blessing that God tells us exists when we work as a team together for the purpose of advancing the Gospel of Christ (1 Corinthians 12:12-27). God doesn’t call us to operate in a silo as super-humans. He called us to work as a part of a team. Even Jesus had 12 disciples and He could have done the work all by himself! What I did differently this time was to allow someone else to help me, and it made a huge difference. Yes, I still do the majority of things, but I’m able to focus my time more on the things that require my attention. When I think back to childbirth, I tried to do it all by myself. I told my friends and family that I was going to drive myself to the hospital and that I had it under control. I didn’t want to ask people to help and I was scared to rely on people to help. I filed it into, the “help doesn’t really work” category so I’m better off doing it alone. However, when I opened myself up to receive help, the Lord blessed me with overflow and I was far happier and had way more joy than if I tried to do it alone. It is a true fallacy that we are to operate alone and the Bible warns us against trying to go it alone (Ecclesiastes 4:9-12). 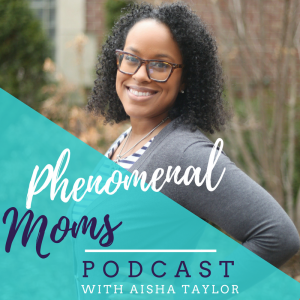 This is why I’m so excited to announce the “Phenomenal Moms” podcast so you will know that you don’t have to go it alone. There are other people who are in your shoes or have been through what you are going through. You are not on an island by yourself. Through the stories that I share from my own life and the lessons that I learned and through the interviews from the moms who join the podcast, you will receive a wealth of knowledge and tons of motivation to help you to thrive financially and live phenomenally using Biblically–based principles. My prayer is that this podcast blesses you and helps you develop a deeper relationship with God and to walk closer to Him. “Phenomenal Moms” is officially on iTunes, Google Play, and Stitcher. Check out the first 2 episodes, hit subscribe, leave a comment, and share it with your friends!! If you want more tips and resources, then check out this FREE grocery reduction challenge to help you to cut your grocery and takeout bill so you can have more money for the things you love! Click here to join the challenge!